Dr. Gluckman and a few of the staff members at Mendon Village Animal Hospital recently traveled to Nashville, Tennessee to accept an award celebrating our 25th Anniversary of being an AAHA accredited hospital! The American Animal Hospital Association is the only organization that accredits veterinary practices in the United States and Canada. AAHA sets strict standards of excellence they require their hospitals to adhere to. Their goal is to ensure that pet owners receive the highest quality care for their pets from well-trained, professional veterinary teams. Unlike human hospitals, animal hospitals are not required to be accredited. This means animal hospitals are allowed to operate by their own standards of care, with no organization to oversee them. Animal hospitals that wish to be accredited by AAHA voluntarily submit themselves to be evaluated. Mendon Village Animal Hospital has chosen to go above and beyond basic state regulations. Less than 15% of animal hospitals in the United States can claim the distinction of being AAHA accredited. Mendon Village Animal Hospital is one of only three hospitals in the Rochester area with this distinction. 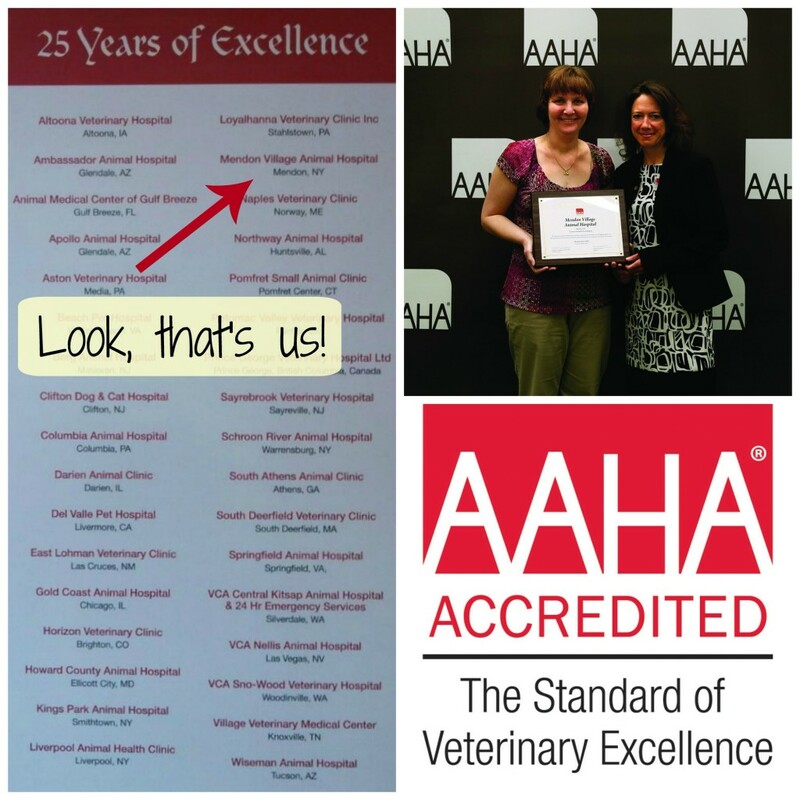 We are constantly striving to meet and exceed the guidelines put in place by AAHA. The doctors and staff at Mendon Village Animal Hospital are proud of our status as an accredited hospital. Next time you stop in for a visit, take a look at the plaque hanging in our entryway. Know that we are always working hard to maintain our accreditation, and are dedicated to providing the best possible care for our patients. If you want more information about the American Animal Hospital Association, check out their website.